Cheryl Glickman has a system. She’ll eat out of a saucepan to cut down on washing up (plates are only for when there are guests). If new soap needs to be put in the bathroom, she’ll wait until the towels in the dryer are done and carry them all together to save a trip. The system allows her to move through life with order and efficiency. From its opening chapters, The First Bad Man is a hilarious portrait of an odd but likeable middle-aged woman. When we first meet Cheryl, she’s consulting a chromotherapist for help with her globus hystericus (lump in her throat), who prescribes her a bottle of ‘essence of red’. These highly original and quirky moments make for laugh-out-loud reading. But as the novel progresses it moves into more bizarre territory, particularly when Cheryl reluctantly agrees to take in Clee, the bovine-like problem child of her colleagues. Clee proceeds to take over her house, disregard her system, abuse the gardener and end up pregnant. Nothing in this story is predictable. 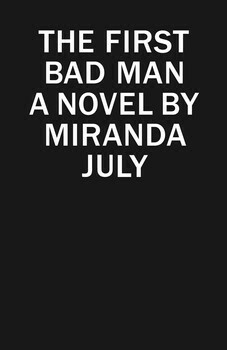 Miranda July has created something unorthodox and unconventional in this, her first long-form fictional novel. July is an actress, filmmaker, artist and author. She is perhaps best known for writing, directing and starring in the 2005 film Me and You and Everyone We Know, which won four prizes at the Cannes Film Festival. Her collection of short stories, No One Belongs Here More Than You, won the Frank O’Connor International Short Story Award. This novel will not disappoint fans of her off-beat but thought-provoking style. In Cheryl, July exposes the most intimate aspects the hidden self – the ‘secret single behaviour’ we all have but never share (such as her tendency to pee in jars when very sad.) Her frank style of writing in the first person has the effect of normalising the eccentric with hilarious effects. Cheryl works at Open Palm, a company that produces self-defence-as-exercise videos, and because of this we’re led into a darker and weirder place as the relationship between Cheryl and Clee takes a more violent turn. I appreciated nuns now, not the conscripted kind, but modern women who chose it. If you were wise enough to know that this life would consist mostly of letting go of things you wanted, then why not get good at the letting go, rather than the trying to have? This is a funny and touching novel, and I’m already looking forward to re-reading it.